Starring: Saoirse Ronan, Beanie Feldstein, Laurie Metcalf, Tracy Letts, Odeya Rush, Lucas Hedges, and more. Shout-Out to my friend Jason for his appreciated additional input regarding the film. If there is one thing I could recommend to people going to see movies, it would be to go into your viewings with as little information as possible. That means minimal trailer viewings, singular review read-overs (AKA only mine *wink*), and little to no outside influence. I open up this review this way because often when I put it in practice, I come out satisfied. My viewing of ‘Lady Bird’ is a result of this exact formula. The extent of my knowledge of ‘Lady Bird’ came in the fashion of knowing it was an A24 film and watching the trailer either once or twice, at most. So here we are now, with little exposure to the film aside from the studio, a trailer view, and some high critical acclaim. ‘Lady Bird’ gets an Oberrated take. The reviews have been in and they are glowing from head to toe. 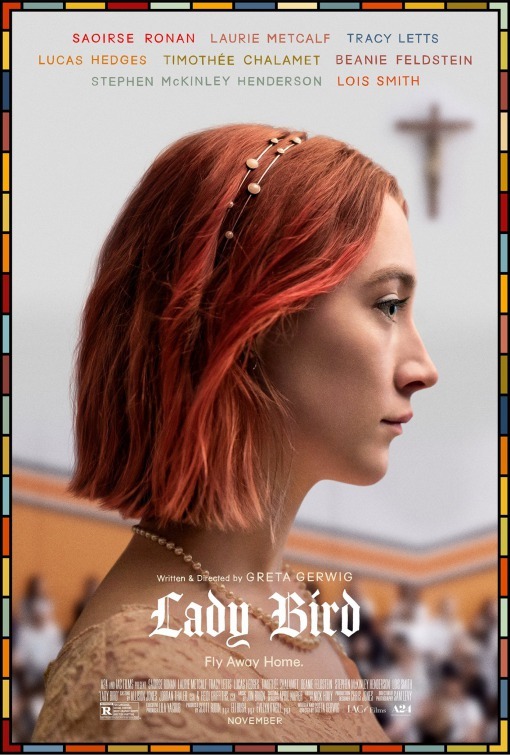 ‘Lady Bird’ at this moment is one of the best reviewed films of all time and in regards to an Oberrating? It sits in high regards as well. I absolutely loved every moment of this 1 hour and 34 minute film. On one end, it hit home with me. I connected with it, I felt it. The film was real. I will be real about it and even say that I had moments where my eyes would tear up at times. It was an incredibly personal film for me and when I can feel a certain way just from viewing a film, those films are the special ones. Aside from personal connection, if I were to give an absolute objective review on the film, it would also be glowing. ‘Lady Bird’ shines in every category possible. The rolling dramatic story throughout the film is heartbreaking in moments and then heart-warming in others. The comedy is hilarious and natural, as dry as it could be delivered at times versus the many moments where it is pure everyday sarcasm. Aside from the elements of the story, the film overall flowed incredibly well. It did not sit in any unnecessarily long bits (Cough, I’m looking at you Rooney Mara pie eating scene despite how comical it was to me). Even within the concept of this, some scenes seemingly fast-forward through bits as if respecting the audience’s intelligence as to knowing what is happening or going to happen. ‘Lady Bird’ truly is a unique experience that dances to its own beat. As if I have not sang about this film enough already, I want to bring attention to this cast. Easily, Saoirse Ronan is a standout queen in the film. She has this charming allure to her that carries her character through every high and low point. I became fixated to her every word and action. She was made to perform Gerwig’s script. Apart from Saoirse as the lead character of Lady Bird, I simply loved every member of this cast. I could go into detail about each individual supporting character but I would more than likely lose your attention. To summarize, keep close watch to each and every character. Everyone is not as they may first appear and if you come to witness this, you will appreciate them. The character depth is something to truly admire. The overall film was just so enticing to watch. While I loved how it ended, it could have easily gone on for another hour and I would have been glued to the screen. ‘Lady Bird’ deserves all its praise and decorations coming in the near future. Posted in 2017 Movies, Movie Review, The Oscars.Tagged Lady Bird, Laurie Metcalf, Saoirse Ronan, The Oscars, The Oscars 2018, Timothee Chalament.